Fact: Hedge Fund Fees are High. Indeed, hedge fund fees are unquestionably the highest amongst active managers of marketable securities. Fact: Some Premium Goods in Life are Considered Worth their Price by the Buyers. Aston Martins, private schools, and family guides at Disney World are all super expensive and yet worth every penny to their consumers. Fact: Hedge Funds have Delivered Gross Returns that are Very Impressive. In all the hullaballoo about hedge funds and the fees they charge, we often miss the important fact that hedge funds have been very successful in generating high risk-adjusted returns at a time when stocks and bonds have been challenged to meet spending needs. While the harshest critics of hedge funds focus on the disproportionate share of gains that accrue to managers1, I have never seen a study that concluded that hedge funds failed to deliver on a gross return basis. Therefore, the $2 trillion question is not whether hedge funds do something valuable in the markets; it’s whether hedge funds are worth the price. Warren Buffett would tell you they are not. He and I made a charitable bet pitting hedge funds against the market over time in which his thesis is predicated on high hedge fund fees. I don’t take this lightly; any proclamation at all made by Buffett about investing needs to be respected. That said, almost any time I have seen a cogent argument addressing hedge fund fees, the unequivocal resolution has been that hedge funds have been worth the price of admission. What follows are three different arguments supporting hedge funds (net of fees). 1. An academic argument that hedge funds are underpriced relative to the degree of active risk they take. 2. A historical argument manifesting that hedge funds have delivered over the long-run. 3. A qualitative argument that fees are no more than a clearing price for supply and demand that richly awards the best and brightest. In August 2006, MIT professor Randy Cohen put together a persuasive argument in favor of hedge fund fees relative to those charged by other active managers. In “Are Hedge Fund Fees a Bargain?” Cohen makes the point that allocators compensate active managers more than passive managers, and the degree of active risk taken by hedge funds is substantially higher than that taken by traditional active managers. It follows that hedge fund fees naturally should be higher than traditional active fees. Using numerical examples, Cohen shows that if a manager generates high risk-adjusted returns, the 1.5%/20% fee structure is a very reasonable price to pay for the service delivered2. Similarly, last year University of Michigan professor Jussi Keppo and Blackrock researcher Antii Petajisto released “What is the True Cost of Active Management? A Comparison of Hedge Funds and Mutual Funds.” While recognizing that hedge funds appear to have much higher fees than actively managed mutual funds on the surface, the authors analyzed the impact of leverage, volatility, active risk, nominal fees, and alpha to find that after adjusting for fees, a moderately skilled active manager is equally attractive to an investor in either investment vehicle and fee structure. The future is notoriously difficult to predict, but the past is far less so. Using the only asset-weighted benchmark calculated on a forward looking basis1, hedge funds looks awfully good on any long-term, ten-year rolling return basis relative to the market and net of fees. The manner in which hedge funds delivered these results is worth consideration as well. 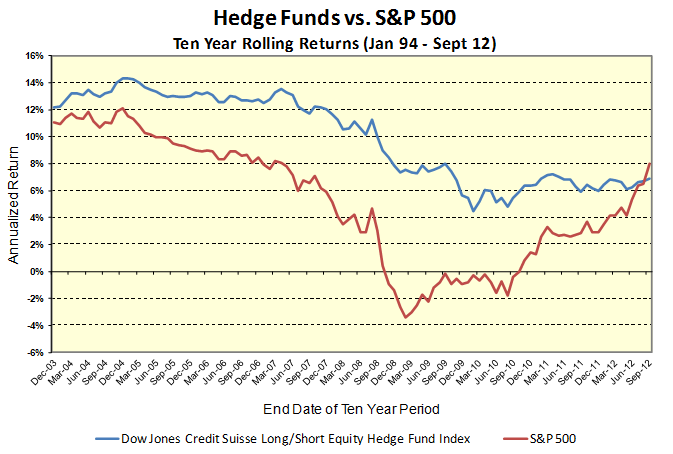 Long-term outperformance by hedge funds occurred solely due to outperformance in down markets. 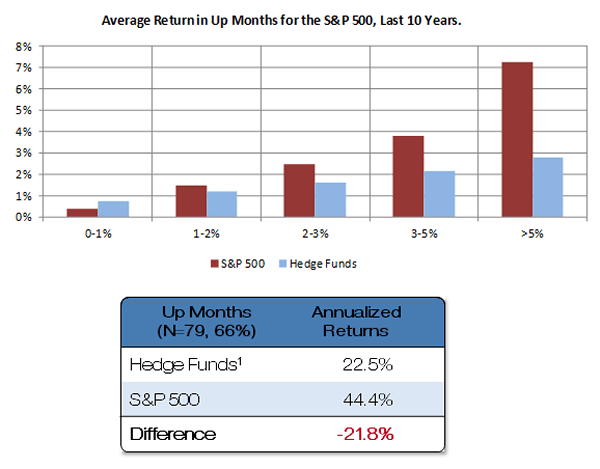 Looking at the last ten years (which is a fair representation of other ten-year periods), in the months when the market fell, hedge funds outperformed by an annualized 20.4%. The converse is also true. Hedge funds underperformed when the market rose, rising 21.8% per annum less than index returns. What is eye-opening, however, is the degree to which outperforming in the worst periods are far more important in the determination of long-term compounded returns. 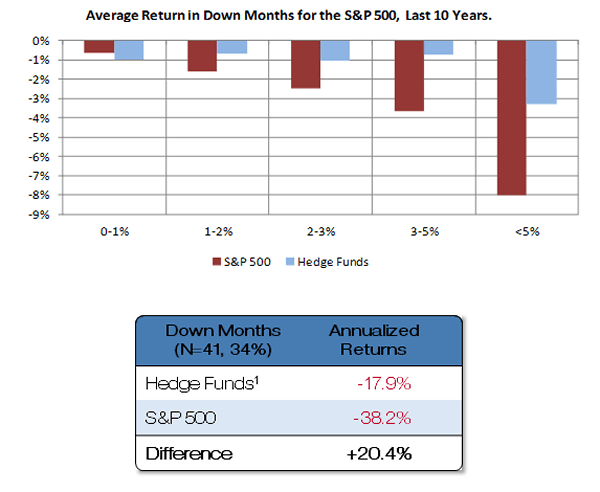 Over this ten year period, the market rose two-thirds of the time and in the months when the market rose, it outperformed hedge funds by more than it underperformed in down months. That is, the market “won” more often and won by a great margin than when it lost. So, the market should win overall, right? Not so fast. It turns out the compounded return of hedge funds and the market during this period was roughly the same. The math of compounding tells this story. 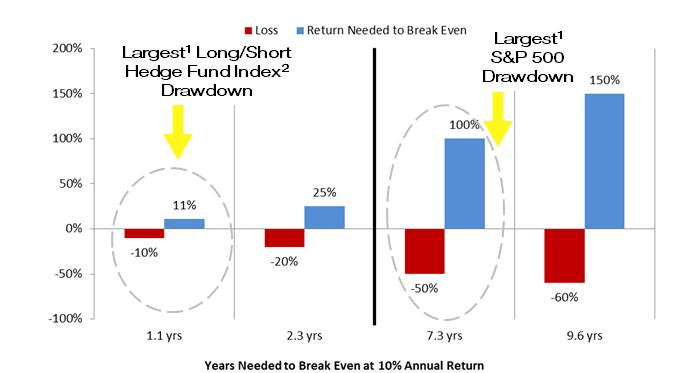 Outperformance on the downside is far more important to long-term returns than outperformance on the upside. In almost every other ten year period since 1994, a similar data trend resulted in higher returns by hedge funds over a decade. If hedge funds are able to deliver this form of asymmetric return profile in the future that they have in the past, investors should be very happy. Hedge funds performing in this manner have a rare ability to win a war by losing every battle. In the two-thirds of the time the market rises, hedge funds will underperform and their investors might get antsy. In the one-third that really counts for long-term compounding, hedge funds outperform but do so at a time when investors are licking their wounds from losing money in other strategies. So it’s heads you win, tails I lose. Each battle along the way, investors have something to complain about. Only after a long period of time will investors look back and realize hedge funds had done right by them all along. I’ve long been confused by statements proclaiming the hedge fund fees are too high. The pricing of hedge funds occurs in a marketplace that matches supply and demand. The current price can’t be too high or too low, it is what it is. Hedge fund fees are higher than traditional active management fees because of the perceived quality of talent and the inherent capacity constraints in hedge fund strategies. Allocators pay more to hedge funds than traditional active manager because they believe they are accessing the best talent in the asset management industry. In a competitive market, the best talent is rewarded with the most lucrative contracts. This is true in asset management just as it is in Major League Baseball. I have little doubt that substantially all of the next generation of stars in asset management globally reside at hedge funds today. Don’t take my word for it. When Warren Buffett searched for his successors to manage Berkshire Hathaway’s stock investments, he had the world as his oyster. Sure enough, he hired two hedge fund managers! Lastly, hedge funds are inherently capacity constrained strategies. As opposed to the largest traditional asset managers, hedge funds have not demonstrated an ability to scale ad infinitum. As a result, the scarce resource extracts a premium price. If investors believe that hedge funds will deliver on the expectation of equity-like returns with less risk than the markets and that capacity is limited in supply, then supply and demand rationally dictates a higher price for hedge fund manager services than traditional asset managers. Given the compelling arguments for an expensive bargain, why is the industry under so much scrutiny? The press repeatedly reports that hedge fund fees are high, but almost never considers the question of whether the premium is worth it. As the marginal capital flowing into hedge funds comes from large pools such as public pension funds, public scrutiny matters more than it did when hedge funds were a cottage industry. These negative vibes weigh heavily on decision-makers. Making matters worse, the last two years have been disappointing to hedge fund investors, and the last four have yielded the worst run of returns against the market since the institutional investing world first took notice of hedge funds fifteen years ago. Investors of all types suffer from recency bias, extrapolating recent returns into the future. Linking cause and effect, skeptics contend that too much capital chasing too few opportunities is a proximate and permanent cause of a secular decline. But history suggests that it’s way too early to tell if what we have witnessed is cyclical or secular in nature. While pundits cast doubt, investors vote with their feet. Hedge fund industry assets are at all-time highs and growing each year, and investors looking for post-holiday shopping discounts seem poised to continue buying the most expensive bargain in town. 2. Though the press would have you believe every hedge fund charges 2%, my experience is that investors only pay 2% if they want to – and I know no one who professionally manages a hf portfolio who pays that much. 3. Naysayers will dismiss this analysis because of claims of survivorship and selection bias in hedge fund data sets. Their arguments miss the forest through the trees – investor experience is asset-weighted and survivorship bias is both immaterial in asset-weighted indexes and occurs in every other index as well (for example, consider the 501st company in the S&P 500). Moreover, the largest hedge funds are rarely found in the indexes. If investors in aggregate chase returns, it is reasonable to profess that the largest hedge funds had the best returns historically.